Thyroid-stimulating hormone, also known as TSH, is made in the brain to control the amount of thyroid hormones that are in your blood. These hormones help control growth, weight, body temperature, heart rate and a host of other things. When you have subclinical hyperthyroidism, your level of TSH is too low, but that your typical hormones excreted by the thyroid, T4 and T3, are within normal levels. Subclinical hyperthyroidism can be caused by many things, including increased production of thyroid hormones and therapies that affect your hormone levels. There are many problems associated with it, such as an increased risk of heart and bone problems. In fact, patients might experience a lower quality of life or even face a higher mortality rate if the problem is not corrected. Subclinical hyperthyroidism can quickly evolve into hyperthyroidism which is more serious. Does Subclinical Hyperthyroidism Cause Weight Gain? Losing weight is the more common sign of hyperthyroidism. However, weight gain can also occur. The increased appetite can lead to eating more food and excessive weight gain. Since losing weight tends to be a hallmark sign of this problem, the weight gain often goes away upon treatment. Seeing a doctor for subclinical hyperthyroidism is very important. But when should you see the doctor immediately? If you are suffering from pain and swelling in your muscles or joints, or you are running a high fever, it’s time to talk to the doctor. If you begin to feel as though you are going to pass out, your heart is beating too fast, you have sudden chest pain, shortness of breath or a seizure, immediately call 911. In some cases, the doctor will watch you closely instead of treating you. That’s because sometimes the treatment can cause other conditions, such as increasing your risks of heart problems or leading to bone density issues. However, if the symptoms become more severe, treatment will have to be given. 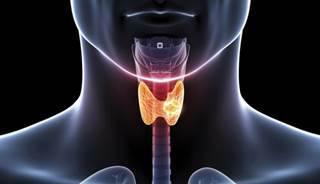 Iodine will work against the thyroid and kill some of the cells there, causing the gland to shrink and relieving the symptoms. It takes three to six months to see results from this method, but keep in mind that those who are pregnant or planning to become pregnant cannot take this treatment. These medications can reduce symptoms by blocking the hormones produced by the thyroid gland. Symptoms will begin to improve within 12 weeks or so. However, some of these medications – particularly propylthiouracil – have been proven to cause other problems, such as damage to the liver. If iodine therapy doesn’t work for you, if you can’t handle the anti-thyroid drugs and their side effects, or if you are planning to become pregnant, you might choose surgery which removes part of the thyroid gland. However, remember that this is rarely an option and doctors will try other remedies first.